Novels based off videogame series have always been a bit of a mixed bag. Anyone who has ever had the misfortune of reading Perfect Dark: Initial Vector or Tom Clancy’s Splinter Cell: Operation Barracuda may have very well walked away from the videogame-novel “meta-genre” completely. But there is some fantastic, mythology-building videogame related fiction out there, and it’s into this crowd that Sega and Creative Assembly are hoping the Total War: Rome II tie-in Total War Rome: Destroy Carthage will enter. As a result of attending the PC indie gaming expo Rezzed 2013, I came into the possession of the prologue for publisher Pan Macmillan’s Total War Rome: Destroy Carthage. But is the book worthy of sharing its title with one of the greatest real time strategy series of all time? Hit the jump and find out! Creative Assembly is renowned for the high level of historical research it consults during the development of its Total War games. This is seen in the historical accuracy of each campaign, map and unit across every entry in the successful series. It’s this level of attention to detail that Total War fans have come to expect from any product bearing the series’ title and will most definitely be expected from Total War Rome: Destroy Carthage. Fortunately, the book’s prologue delivers historically accurate fiction by the bucket load. After only a few paragraphs of the novel’s prologue it becomes abundantly clear that Destroy Carthage is a book written by a Roman history enthusiast for Roman history enthusiasts. Terms such as “standards”, “phalanx” and “legionaries” are thrown around with great authority, but little explanation. Fortunately, I’m still able to recall the fundamentals of Roman-era military tactics and terminology from a fairly decent British state education. Even so, many geographical locations and other terms described in Destroy Carthage went over my head and are likely to bemuse those with a limited understanding of Roman history. But this is by no means a bad thing. If anything, it only goes to show the effort that has gone into putting this project together. While many videogame novels are adorned with the names of unknown authors and equally unknown pseudonyms, Pan Macmillan assigned Destroy Carthage to accomplished author and marine archaeologist David Gibbins. With seven works of history inspired fiction, one international best seller and a decade’s experience as a lecturer at the University of Cambridge under his weathered belt, Gibbins’ mixed experience is a perfect fit for the Total War series. In fact, after the first few thoroughly educational paragraphs of Destroy Carthage, Gibbins takes us into a full-on Roman battle: the Battle of Pynda. The story of Destroy Carthage, or at least the beginning of it, focuses on Roman the 17 year old junior tribune Scipio, his 18 year old companion Fabius and their friend Polybius, a former Greek cavalry commander. After spotting the advancement of the Macedonian phalanx, the three men must collaborate in order to devise a truly Roman solution to the seemingly indestructible enemy formation. The ensuing battle is both incredibly thrilling and appropriately violent. Gibbins clearly understands the immense levels of fear, excitement and adrenaline that pump through each Roman soldier, and the surgical brutality of their battles. Eyeballs burst from sockets, heads roll, and blood soaks the Earth. Then, as is the case with most war-time battles, it’s over in a matter of moments. Rome stands victorious over Macedonia, the remnants of Alexander the Great’s empire have been destroyed and the rest is, quite literally, history. Keep in mind all this is covered in the space of fourteen and a half pages of Total War Rome: Destroy Carthage‘s prologue. Total War Rome: Destroy Carthage already looks to be a rare breed of videogame novel that does more than simply expand or focus on a specific aspect of the videogame from which it is spawned. Instead, its narrative, setting and historical accuracy make it a legitimate part of the Total War: Rome II experience. Of course it must be stressed that this conclusion has been reached after the reading of the novel’s prologue and that the book is by no means essential for the full enjoyment of Total War: Rome II. 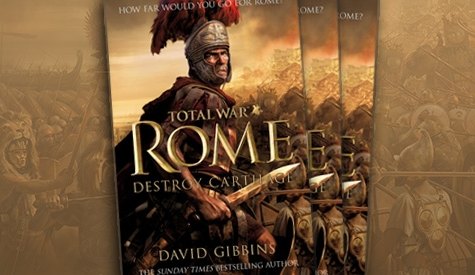 However, I’ve yet to play a single game in the Total War series myself and still enjoyed the first 15 pages of Destroy Carthage immensely, so one can only imagine how vivid Gibbins’ tale will be to Total War fans and those waiting for the release of Rome II. Total War Rome: Destroy Carthage will be released in hardback and digitally on September 3rd of this year, coinciding with the release of Total War: Rome II. If you’re thinking about purchasing this book or have any notable run-ins with other videogame related novels, be sure to leave us a comment below. The Sega Addicts Podcast returns tomorrow with Episode 101!